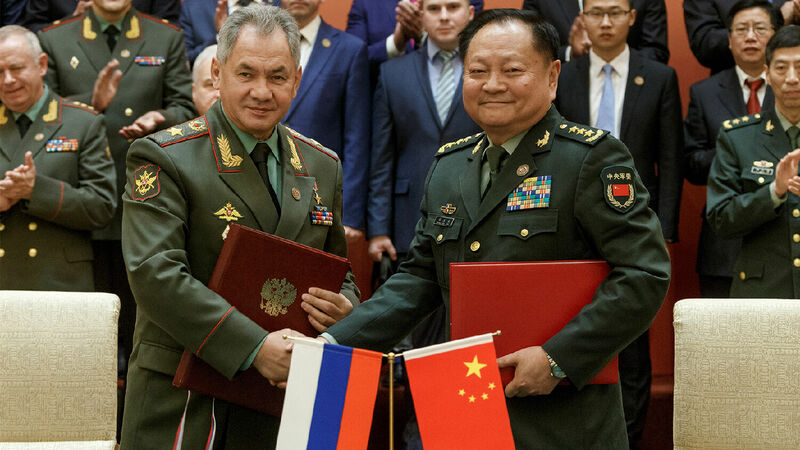 Russian Defense Minister Sergei Shoigu (left) and Zhang Youxia, Deputy Chairman of the Chinese Central Military Commission, shake hands after they signed joint documents at their meeting in Beijing on Oct. 19, 2018. The torrent of news about expanding cooperation between Russia and China continues to increase. And though many experts are concerned about the quickly deepening intimacy between these two revisionist nations, the general consensus remains that a real Russia-China alliance does not exist. But a new analysis says that consensus is wrong. “It is long since time that analysts and policymakers acknowledge the reality that is evolving right before their eyes,” wrote Stephen Blank, a senior fellow with the American Foreign Policy Council, for Second Line of Defense last month. “[T]he steadfast denials of a military alliance dynamic here are not based on the evidence of arms sales, technology transfer, joint exercises, conventional and nuclear coordination, and long-term strategic dialogues,” he wrote. Blank says onlookers should not be deceived by the fact that the Russian and Chinese leadership do not use the word “alliance” when discussing their relationship. He says this may be intentional subterfuge. More significant than the ever evolving labels given to Russo-Chinese ties are the actions showing them to be steadily deepening. And in military matters, the most significant aspect of the relationship, the two have held 30 major joint exercises since 2003. Blank calls special attention to the joint air and missile defense exercises the two held in 2017, saying it “suggests an alliance” because it required both nations to “put their cards on the table and display their c4isr.” This is a broad term referring to the four “c”s of command, control, communications and computer, and also to intelligence, surveillance and reconnaissance. The systems and techniques related to c4isr equip decision-makers and soldiers with actionable information, enabling them to accomplish their goals. Such information is among a nation’s most sensitive, so seeing Russia and China share it with each other indeed indicates a rare camaraderie between them. “[T]his alliance is not merely a political relationship but one of active military collaboration,” Blank wrote. In recognition of the military basis for the Russia-China relationship, last week’s Worldwide Threat Assessment of the U.S. Intelligence Community warned that China and Russia are engaged in a “race for technological and military superiority” that will be a defining feature of the 21st century. “China and Russia are more aligned than at any point since the mid-1950s, and the relationship is likely to strengthen in the coming year as some of their interests and threat perceptions converge,” the assessment said. Vasily Kashin, senior research fellow at the Higher School of Economics in Moscow, told the Trumpet in September that “if the current trend of deterioration of the Russian-U.S. and Sino-U.S. relations persists, a formal military alliance” between Russia and China could emerge. The treaty “clearly required both sides to consider some sort of joint action in the case of a threat from a third party,” Kashin wrote. The Trumpet closely watches the deepening ties between Russia and China because the Bible prophesies of an Asian confederation that will form in the end time. This Asian bloc is referred to in Revelation 16:12 as “the kings of the east.” Scriptures show that this bloc will play a major role in a nuclear World War iii. Actually we have been proclaiming for over 50 years that Russia, China and other Asian nations would ally themselves in the end time. Notice that he said they would “ally” themselves—not just build a “privileged strategic partnership” or any of the euphemisms that are often used. And we are in that end time now. … When these Asian nations—extremely powerful nuclear-armed countries—begin to show solidarity with each other regarding moves like that, what does that portend for the world? I tell you it is woe to the world. It will cause many serious problems. To understand more about the Bible passages that discuss this Asian confederation and its role in end-time events, read Mr. Flurry’s article “Asia Stands With Putin” and order your free copy of Russia and China in Prophecy.